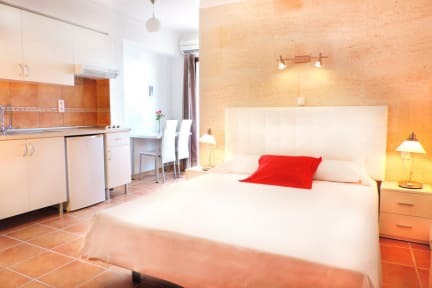 Hostal Marblau Mallorca v Mallorca, Španělsko: Zarezervujte nyní! Cancellation: You may cancel free of charge until 6 days before arrival. You will be charged the total price if you cancel in the 6 days before arrival. Please note that guests that arrive outside of check-in hours will find the instructions on how to access the room or apartment in the hall of the hotel. Only dogs are accepted in our facilities. Dogs 10 € per day. In no event will the dog be left alone in the room or apartment. Noise: The dog must not cause disturbance like noise, barking, etc. in consideration for the neighbours. Hygiene: Please make sure the dog does not defecate or urinate in the room or apartment. The dog must not climb on the beds or sofas, the hotel reserves the right to charge the customer for the costs of cleaning and/or repairs for damages. Please note that daily cleaning of the rooms is included, except on Sundays. Please note that cleaning upon check-out is included. Studios and Apartments are cleaned twice a week, and only for stays of 5 nights or more.